BlackBerry has just introduced the Z10 , its new flagship comes with a new operating system and completely renovated and is the company's big bet this year. Will you need to tackle the ultimate Android smartphone? Let's find out! 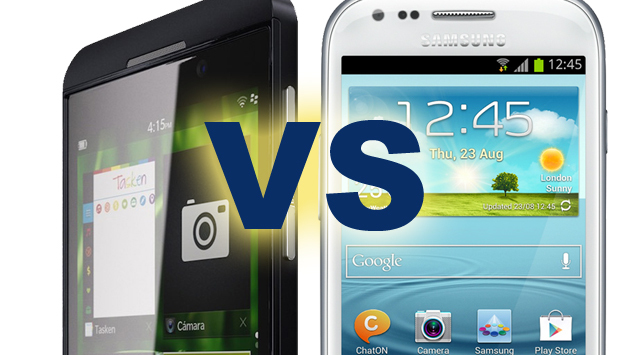 Samsung Galaxy S3 vs BlaxkBerry Z10 . No doubt that BlackBerry (formerly known as RIM) has sought to give a qualitative leap with the new Z10 and the new BB10 operating system, both widely than previous devices and OS versions. Is it enough to resurface? Will to live up to the high-end Android smartphones? Let's see. The Samsung Galaxy S3 has a big screen HD Super AMOLED 4.8-inch display with a resolution of 1,280 x 720 pixels and 306 ppi, while the BlackBerry Z10 incorporates a capacitive panel 4.2-inch LCD with a resolution of 1,280 x 768 and a incredible 356 ppi. The Galaxy S3 has a powerful quad-core Exynos chip to 1.4GHz along with 1GB of RAM, while the BlackBerry Z10 incorporates a Qualcomm chip S4 Plus 1.5 GHz and 2 GB of RAM. The Galaxy S3 is storage in three versions: 16, 32 and 64 GB, in all cases, expandable to 64 GB with microSD card, while the BlackBerry Z10 comes in a single variant of 16GB (expandable with microSD cards up to 64) . The Samsung Galaxy S3 comes with an 8 megapixel camera and a host of features including image stabilization, touch focus, 1080p video capture and LED flash. Meanwhile, the BlackBerry Z10 features a 8-megapixel main camera with LED flash capable of recording video at 1080p but large aggregates. It has easy detection and touch focus, although it incorporates TimeShift (to take five pictures quickly) and an aperture of F2.2. 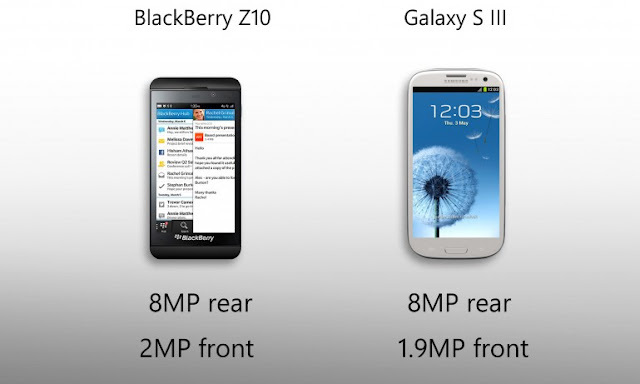 In addition, the new flagship BlackBerry comes with a 2 megapixel front camera for video calling. The Galaxy S3 has a 2100 mAh battery compared to 1,800 mAh of the Z10, which according to its creators offers better performance than the Samsung flagship. This has been a great bet for this year's BlackBerry. The new OS BlackBerry 10 has marked a before and after in the Canadian company that has incorporated elements that bring BB10 to iOS and some Android. Now find multiple home screens with shortcuts and various elements that make a great leap in relation to previous versions. 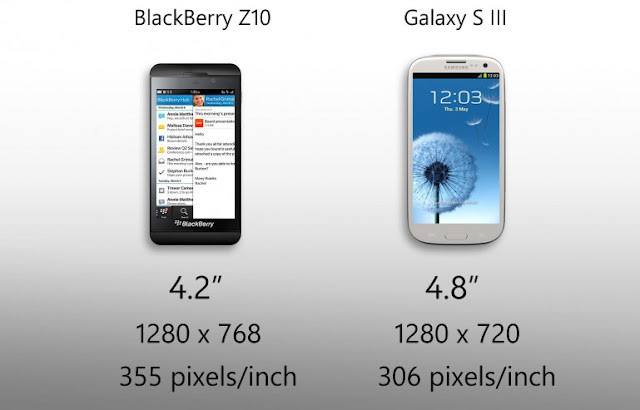 However, I think BB10 is still below Android. The Galaxy S3 came with Android 4.0.3 Ice Cream Sandwich although it has already been updated to Android 4.1.2 Jelly Bean and presents a superior performance than consider the new BB OS. The Galaxy S3 is 71 x 8.6 x 137 mm and weighs 133 grams, while the Blackberry Z10 is slightly smaller with 66 x 9 x 130 mm (but thicker) and slightly heavier as it weighs 137.5 grams. 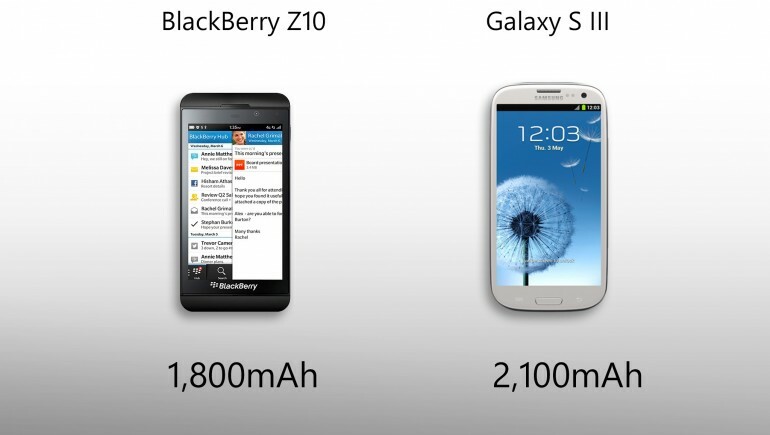 BlackBerry Z10 is vastly superior to previous BlackBerry devices in terms of features and specifications. In addition, BlackBerry 10 presents major improvements over previous versions of the operating system with which we saw a big leap in quality in both hardware and software. However, as good gan of Android I am, for now I'll take the Galaxy S3 while not denying that RIM, which will be renamed soon just BlackBerry, has made ​​a very good job with their new device with the new OS .